Designed for EFI or carbureted street/strip applications, the Eliminator has a patent-pending dual chamber pumping mechanism. This continuous-duty pump supports more HP in a true street vehicle than any other pump and provides about 25% more flow compared to the A1000. 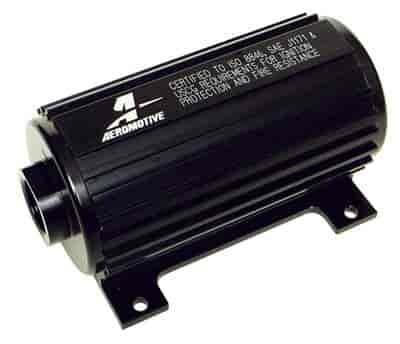 Aeromotive Eliminator fuel pumps are compatible with pump gas, race gas, alcohol, ethanol, and E85. Eliminator Fuel Pump Fitting Kits include two straight anodized black fittings (sizes below).